Impressive photo of Aquitania’s top of house. With her grand Cunard funnels stretching out behind, she is the epitome of an ocean liner. Written on the back in pencil is “Bertram Hayes,” which makes this a bit of a mystery. 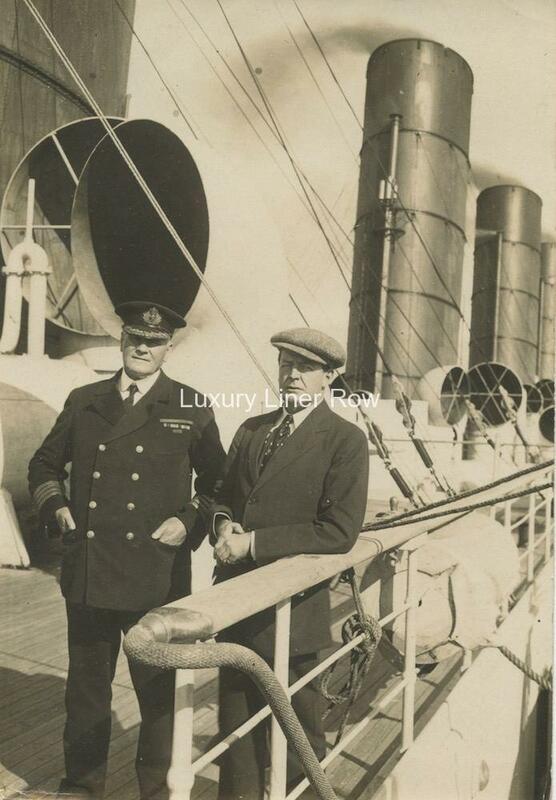 The man in the Cunard uniform is certainly Aquitania’s most famous captain, Sir Charles, a man known for his prodigious eating habits. In fact, writer Lucius Beebe claimed his uniform jackets had to be specially reinforced due to his huge belly! It would seem that the person who made the note simply got the name wrong. 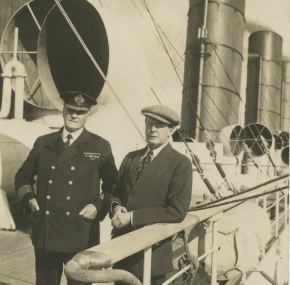 The other gentleman in the jaunty cap is famed British Admiral David Beatty. (Thanks to a very eagle-eyed visitor to the website for that bit of info!) The photo measures about 6″ x 4″ and in excellent condition.